Margarine may help lower your cholesterol levels compared to butter. Some types of margarine now tout their plant sterol or plant stanol content and mention the potential cholesterol-lowering benefits of these ingredients. These types of margarine may also be "light" margarines, which contain about half the calories of regular margarine or butter. A number of factors affect whether these margarines will improve your cholesterol levels. Margarine is lower in saturated fat than butter, and decreasing your saturated fat consumption may help you lower your cholesterol. Avoid any margarines that contain hydrogenated oils, because these contain trans-fats, which are worse for you than saturated fats. 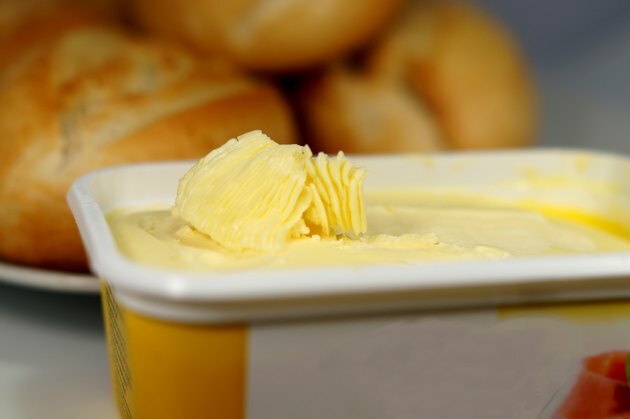 Regular margarine has about 2 grams of saturated fat per tablespoon compared to the 7 grams in butter. Reduced fat margarines have about 1 gram of saturated fat per tablespoon. Using plant sterol-/stanol-containing margarines may help you lower your cholesterol levels by 5 to 15 percent, especially if you have high cholesterol, according to a review article published in "Food & Nutrition Research" in 2008. Not all studies show the same beneficial effects, however. A study published in "Food and Chemical Toxicology" in October 2006 found that these margarines helped people maintain their cholesterol levels, but didn't cause decreases in cholesterol.